Create your own patterns from digital images and photographs. The Connected Pattern Maker is the easy to learn and fun to use software program that lets you create unique line art patterns from digital photographs and images. The Pattern Maker saves you time and money by streamlining the design process. Quickly create patterns with the easy-to-use drawing tools. Print patterns to any size and with any line thickness. Create A Pattern in Less Than An Hour! 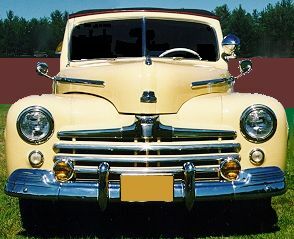 With the Connected Pattern Maker, you can turn a picture of a classic car into a pattern that can be printed as small as a thumbnail or as large as an actual car using your inkjet or laser printer in less than an hour! Get Over 140 Free Patterns! Over 140 ready-made patterns are included with the Pattern Maker. The patterns are organized into three collections: Fish Collection, Wildlife Collection, and the Building Collection. The patterns in the collections can be printed to any size and with any line thickness. Works for All Your Artistic Needs!